(L to R) Dr. Matthew Brown and Dr. Adam Blau lead the robotic surgery program at MelroseWakefield Hospital, providing the latest advances in minimally invasive surgical medicine to patients locally. Robotic technology is revolutionizing the experience of surgery, and MelroseWakefield Hospital is at the forefront of this innovation in surgical medicine. technique that allowed for less postoperative pain and a quicker recovery. Dr. Blau was at the helm of the latest advancement in robotic surgical technology, the da Vinci Xi® surgical system, for the first robotic-assisted surgery at MelroseWakefield Hospital. Matthew W. Brown, MD, and Dr. Blau lead the robotic surgery program at MelroseWakefield Hospital. Robotic-assisted surgery allows surgeons to perform many types of complex procedures with more precision, flexibility and control than is possible with conventional techniques. A surgeon is always in full control of the surgery and robotic system. Through tiny incisions, robotic technology translates the surgeon’s hand movements into smaller, more precise movements of tiny instruments inside the patient’s body. The machine’s robotic arms and wrist-like joints can move 360 degrees in any direction and become virtual extensions of the surgeon’s eyes and hands. This allows for more effective, accurate surgical movements with unparalleled range of motion and control. The state-of-the-art robotic system is changing the way patients experience surgery at MelroseWakefield Hospital. The technology’s precision translates to less invasive, quicker surgeries, which has significant benefits for patients. “Patients who have robotic-assisted surgery often recover faster, have less postoperative pain, and need little or no narcotic pain medicine compared to open and laparoscopic surgeries,” said Dr. Blau. 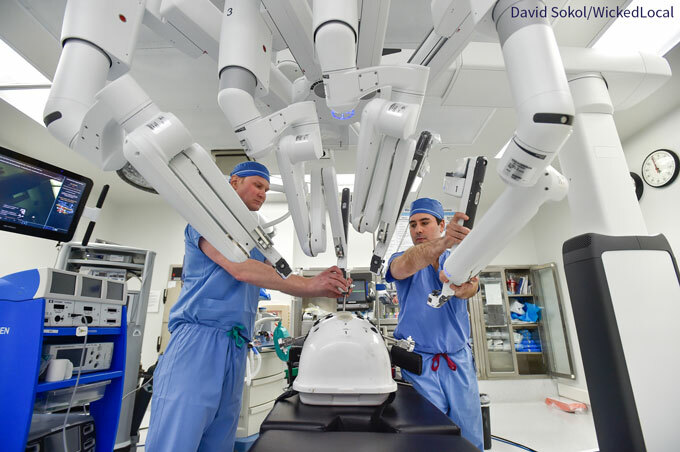 Robotics is the next frontier in surgery, and the possibilities to come are exciting. Plans are already in place to expand on the success of 2018 to offer even more robotic-assisted specialty surgeries in 2019. “Patients don’t have to look far for the most advanced surgical experience. We are bringing it right here to their neighborhood,” said Dr. Brown.